i’ve been looking for this claret and blue and white tipped fred prerry for quite some time. it seemed as soon as i started looking for it, you couldn’t buy one in my size anywhere. well, i found it in my size and i’m going to get it. will anybody else appreciate my style? no, though i have had a couple of patrons compliment me on my shirts before. see, i’m trying to be somewhat stylish and mod. maybe, when i’m really a real librarian i’ll start wearing the skirts and such and put everybody else to shame. next stop- ben sherman. i think i’m going friday to pick up this, this, or this. then i will be an even more styling moddish library goon than before! the final piece of my style puzzle will have to be these shoes. then nobody will be able to argue that i’m just another trashy number. i will be the library face! i’m doing homework and planning my show tomorrow. i’m trying to think about things that make me feel happy, and i mean that sort of warmth that comes from within that makes me smile without thinking. it was weird, because this morning when i saw the results for everton and sheffield wednesday, i went skipping through kalx cheering. it was great but silly. wearing a ben sherman shirt made me feel like that, too, which means i’m shallow. but why on earth can’t they make more mod shirts for the ladies? all the mens shirts are quite nice, but the ladies shirts are fugly. can i meet more hipster librawr nrdz? i’m about to go to sleep. i’m in monterey, ready to go to internet librarian in the morning. this is my first professional conference and i’m pretty nervous. will it be boring? will i be library 2.0 enough for the cool kids? will people automatically dismiss me because i have a lip ring, black plastic framed glasses, and wear a hoodie? 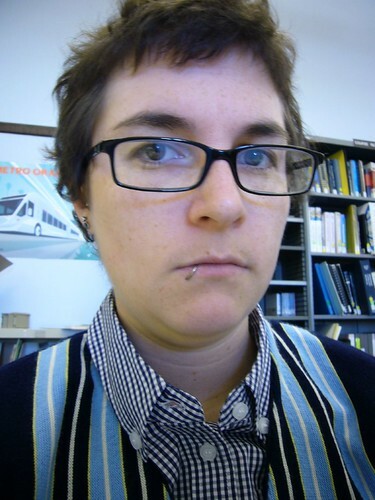 or will people think i’m one of those hipster library things? who knows! rainbow, originally uploaded by kendrak. it’s been a while since robojoe and i explored western nevada. let me tell you, it’s a big pile of nothing. lots of long, lonely roads on the high plains of the desert. i think we even saw a tumbleweed at one point on highway 95. here’s the basic route, not counting a couple of the ghost towns. it’s a lot of driving, innit? 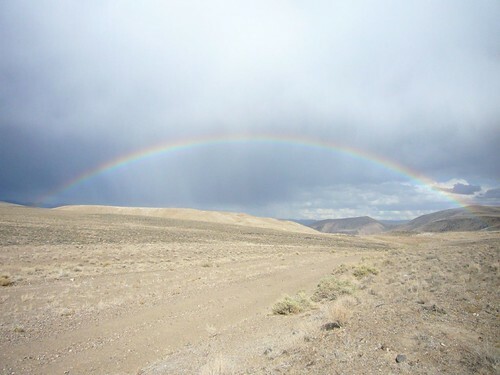 this picture is from candelaria, nv after a little rain storm. let me tell you, that town was dead. here are pictures from the whole trip, or most of it. i didn’t take many pictures in southern california, but we didn’t do much there. i talked to uc irivine, i talked to ucla, i hung out with a librarian in downtown la, and we hung out with ivymike. vegas was something of a bust, but i did get a ben sherman that really makes me look like a skinhead. i also spent a pretty penny on a fred perry, but i have to look sharp, innit? oh, and don’t go to tonopah. it’ll make you look like this. there’s really nothing there, other than the ramada inn and giggle springs.